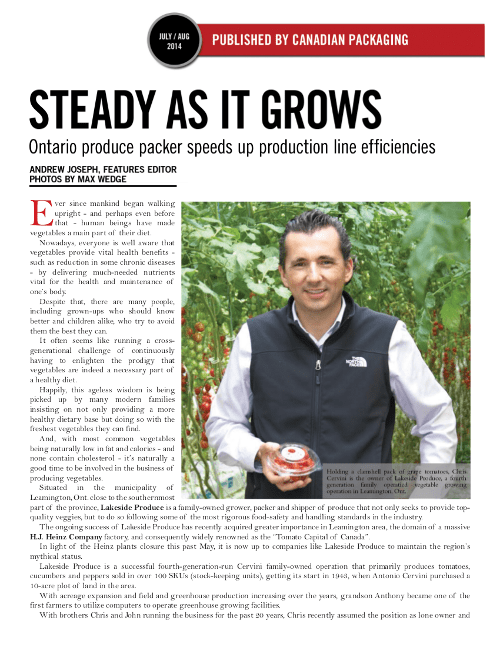 Ontario produce packer speeds up production line efficiencies. Ever since mankind began walking upright – and perhaps even before that human beings have made vegetables a main part of their diet. Nowadays, everyone is well aware that vegetables provide vital health benefits such as reduction in some chronic diseases by delivering much-needed nutrients vital for the health and maintenance of one’s body. Despite that, there are many people,including grownups who should know better and children alike, who try to avoid them the best they can. It often seems like running a cross generational challenge of continuously having to enlighten the prodigy that vegetables are indeed a necessary part of a healthy diet. Happily, this ageless wisdom is being picked up by many modern families insisting on not only providing a more healthy dietary base but doing so with the freshest vegetables they can find.